Marcel Duchamp was a famous expatriate, a wanderer, living and working in Paris, New York, and Buenos Aires and escaping from them in turn. But exile, argues T. J. Demos in this innovative reading, is more than a fact in Duchamp's biography. Exile—in the artist's own words, a "spirit of expatriation"—infuses Duchamp's entire artistic practice. Indeed a profound sense of dislocation—from geographical situation, national identity, and cultural conventions—deeply informs the mobile objects and disjunctive spaces of Duchamp's readymades and experimental exhibition installations. Duchamp's readymade constructions, his installations for surrealist exhibitions in Paris and New York, and his "portable museum" (the suggestively named La boîte-en-valise), Demos writes, all manifest, define, and exploit the terms of exile in multiple ways. Created while the artist was living variously in New York, Buenos Aires, and occupied France, during the global catastrophes of war and fascism, these works express the anguish of displacement and celebrate the freedom of geopolitical homelessness. The "portable museum," a suitcase containing miniature reproductions of Duchamp's work, for example, represented a complex meditation—both critical and joyful—on modern art's tendency toward itinerancy, whereas Duchamp's 1942 installation design entangling a New York gallery in a mile of string announced the dislocated status that many exiled surrealists wished to forget. Demos connects Duchamp's condition of exile to forms of displacement within photographic practice and modern museum exhibitions, theorized extensively at the time by Walter Benjamin, André Malraux, and Frederick Kiesler. He claims that in the period of fascism's elevation of the home as the site of national imagination, Duchamp's antinational identity became a form of resistance, just as his artistic practice represented a complex response to capitalism's increasing institutionalization and marketing of art. 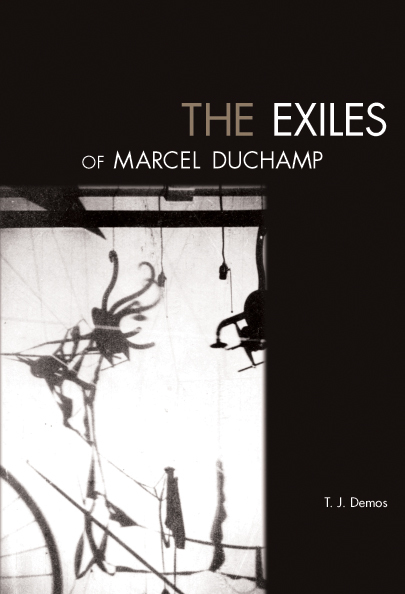 Duchamp's exile, writes Demos, defines a new ethics of independent life in the modern age of nationalism and advanced capitalism, offering a precursor to our own globalized world of nomadic subjects and dispersed experience.